William A. Kelsey began making inexpensive presses for amateurs in 1872, and his Excelsior became the longest-lasting press on the market. For more information, see the Excelsior Model P page. One of the earliest Kelsey Excelsior presses, the Model No. 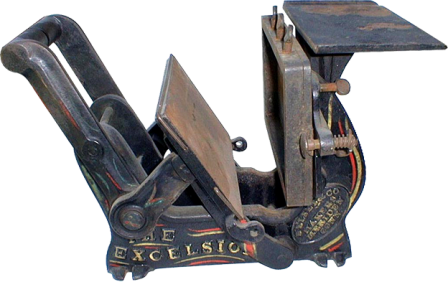 2 1/2 is a hand-inking press like the Excelsior Trunnion. The Model No. 2 1/2 Excelsior bears a patent date of 1873; by 1893 it had been discontinued. This particular press was in the collection of the Mahopac Farm Museum in Mahopac, New York until October 1997, at which time the entire contents of the Museum’s unique collection of historic and collectible items was put to auction by its owner, Bernard Zipkin. The press is missing the gripper bar and grippers.